There has been a house opposite the top of Common Road for hundreds of years, but when Lynda moved into one of the renovated buildings to the side of the current Chorleywood House, she wondered about its history, and put her mind to finding out about it. She looked up records in the library, visited the Rickmansworth Museum and tracked down people who had lived in the house and worked in the grounds. 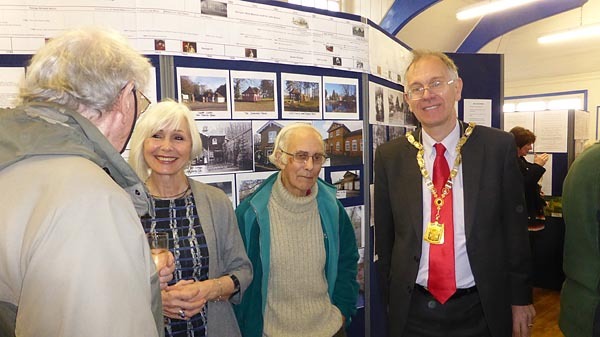 She found old documents and photographs, and with the encouragement of the Friends of Chorleywood House Estate she has created an exhibition in the Summer House near to the main house. Here you can see the story of the house and its various owners, read about what it was like working there, look at photographs, some dating back to the beginning of the 20th century, when Lady Ela Russell (cousin of the Duke of Bedford) was living there and introducing improvements, such as rebuilding part of the house, developing formal gardens, farm and parkland, even introducing electricity. Also there are details of current activities there, including free tennis courts, a newly established orchard, birds and butterflies to be seen, places to picnic or clamber on tree trunks. The exhibition opened at Easter and again on the Spring Bank Holiday. Such was its success with around 200 visitors each weekend that it is to be open again at the May Bank Holiday and again during Village Day on 11th July.